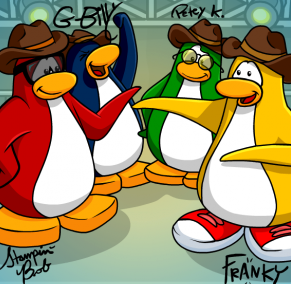 The Penguin Band make alot of good music for club Penguin! 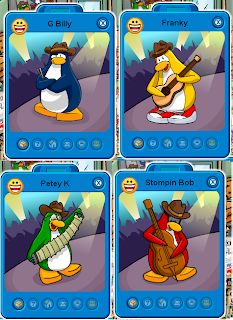 They have G Billy, Petey K, Stompin' Bob, and Franky. All of them are band members and help each other as a team to make the island more improved with music. To find them check alot of servers! They stay on a server for 4 min. At the least. But i've seen Franky stay on a server for a long 20 min. The penguin band are often split apart so you have a better chance finding them! But sometimes they are together. They always have a crowd around them. Things to know about them! 2. They are NOT robots. 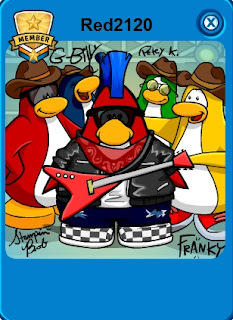 Theres a real Club Penguin worker playing them. 4. They do NOT have a igloo. They are always on tour. 5. They do NOT have penguin mail. But you can get a special background from Them! They have 1. Red! common people what is "Tagging" grrr no one is reponding!!!! In CP is there any way you can track me down to be your buddy? my penguin name is mandyunicorn.